Rev. Dr. Michael Friday has served both the Union Baptist Church in Mystic, Connecticut, and the Grace United Church of Wellsville, New York as Interim Pastor, during the last three years. Before this, for seven years, he was Senior Pastor of the New Life Baptist Church of Bellevue, Nebraska; this, after having served the American Baptist Churches of Connecticut for five years. Dr. Friday came to America after being pastor of Baptist congregations in Trinidad and Tobago, and Jamaica, including the historic Phillippo Baptist Church, a congregation that played a major role in Jamaica’s Emancipation proclamation in 1838. Having been ordained on September 12, 1987, by the Baptist Union of Trinidad and Tobago, he became, in 1988, the Union’s youngest president. He was a member of the Academic and Theological Work Group of the Baptist World Alliance between 1985 and 1990. In Jamaica, he was a full time Police Chaplain with the Jamaica Government, after which he was Pastor of the St. Ann’s Bay Circuit of Baptist Churches. Dr. Friday’s colorful vocation has included service in the Jamaica Baptist Union as Preacher on Christ for Today, a weekly broadcast of the Union on Radio Jamaica (RJR), as a weekly columnist on religion for the Jamaica Gleaner newspaper, and as writer for Christian Publications (CCP) an arm of the Caribbean Baptist Fellowship. Apart from Christian Education materials, he has authored a Bible Study Workbook on Christian Stewardship. His first book, And Lead Us Not Into Dysfunction, is due out later in 2017. Rev. Friday has gathered a wide range of church leadership experience, having served on the American Baptist Churches of Connecticut’s Long Range Committee, and Visions Explorations Committee, as well as the American Baptist Churches of Nebraska as Vice-President of the Ministers’ Council, and Chair of the Department of Professional Ministry, which examines, processes and admits persons for ordination, and attends to matters of professional development and conduct. He has also served the American Baptist Churches, USA’s, Transformed by the Spirit adaptive change initiative as a coach. 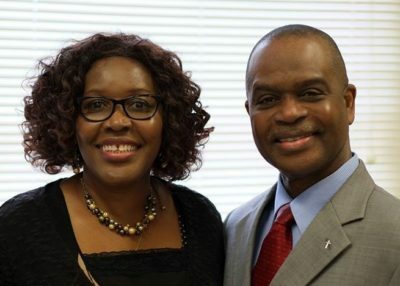 He has a Master’s degree from Eastern University, in Organizational Leadership which includes organizational dynamics, leadership development, strategic planning and change management; a Doctor of Ministry degree in Preaching and Teaching Homiletics from the Gordon-Conwell Theological Seminary; a seminary degree from the United Theological College of the West Indies and an honors degree in Theology from the University of the West Indies. Rev. Friday has preached revival meetings, conducted Bible conferences and leadership development seminars in Trinidad and Tobago, Barbados, Antigua, St. Vincent, the United Kingdom, Illinois, Missouri, Florida, Maryland, Virginia, Ghana, and Liberia, and has a passion for short-term international mission initiatives. Michael is the last of five children born to Rochford and Clara Friday. He resides in Naugatuck with his wife, Dr. Vivienne Friday, a nursing educator with the University of Bridgeport and Bridgeport Hospital School of Nursing. They have three adult children, Davewin, Rhaema and Jeremy, and one granddaughter, Eva. He loves a good game of Scrabble or Pictionary, and loves Cricket just a little more than Baseball. He loves the indoors as much as outdoors; and given his taste for a wide variety of foods, would hire a professional chef if he could afford it! Finally, by God’s grace and by the fascinating richness of God’s earthly family, the Rev. Dr. Michael Friday has enjoyed unbroken decades of Christian fellowship and growth in the various churches and communions where he has sojourned since his profession of faith at age 10, baptism at age 11, and answering the call to the ministry at age 15. He loves the Lord and the Church, and remains committed to the continued renewal and transformation of the Church in ways that enable it to welcome more new believers. This is his continued objective as he serves the Union Baptist Church of Swissvale. Copyright © 2019 Union Baptist Church of Swissvale.